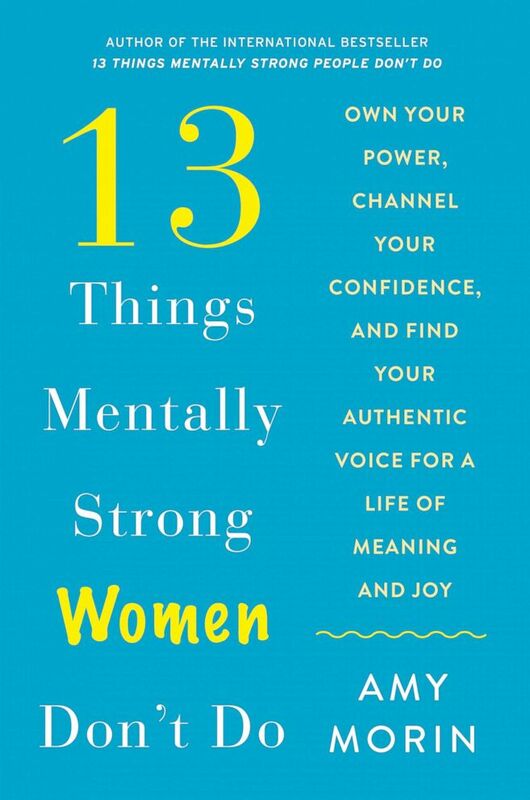 Amy Morin is out with a new book, "13 Things Mentally Strong Women Don't Do." New year, new mentality. Amy Morin, author of the new book, "13 Things Mentally Strong Women Don’t Do," shares her top three things that strong women don't do and how you can change your mentality in 2019 to build up mental strength. Read on for Morin's takeaways in her own words. Many of the role models who are said to be the epitome of mental toughness -- Navy SEALS and elite athletes -- are men. But women, who constantly exemplify mental strength, are often overlooked. Women need mental strength to create positive change in their own lives, and tackle challenges like the gender pay gap or sexual harassment. Building mental strength is a lot like building physical strength. If you wanted to become physically stronger, you’d need good habits -- like going to the gym. But if you really wanted to see some muscle definition, you’d also need to give up bad habits—like eating too much junk food. Developing your mental muscles takes exercise too. It’s important to practice good habits, like gratitude, but if you want to fine-tune your muscles, you need to give up the bad habits that drain your mental strength. Men and women build mental muscle the same way, but cultural norms and societal pressures put women at a greater risk of engaging in certain unhealthy habits that will rob them of mental strength. 1. Compare themselves to other people. From “Who wore it better?” to marketing campaigns that insist certain products will make you more beautiful than other women, the pressure to compare yourself is everywhere. Not to mention, everyone looks happier, fitter, and wealthier on social media. But comparing yourself to other people will leave you feeling disappointed and discouraged. Look at other women as opinion holders you can learn from, not someone you need to compare yourself to. There’s a lot of pressure to be humble and no one wants to look like a narcissist. But, it’s easy to downplay your success so much that you don’t take credit for your accomplishments. There’s nothing wrong with saying you feel proud that your hard work has paid off or that you’re grateful for what you have. Don’t be shy about simply saying “thank you” when you receive a compliment either. There’s no need to offer a compliment back or pass the credit on to someone else. 3. Fear breaking the rules. It’s tempting to go with the flow and follow the unwritten rules and gender norms you were taught. But, rule breakers pave the way for positive change. Apply for a job even if you aren’t quite qualified. Worry less about dressing, acting, and sounding like the other people in the office. Be willing to bend, stretch, or break the rules once in a while and live life on your own terms. No matter how strong you feel, there’s always room for improvement. And fine tuning your mental muscles can help you think, feel, and act your best. Let go of the counterproductive bad habits that are holding you back so you can move forward and reach your greatest potential.